Rh family, C glycoprotein, also known as RHCG, is a protein that in humans is encoded by the RHCG gene. RHCG plays a critical role in ammonium handling and pH homeostasis in the kidney. 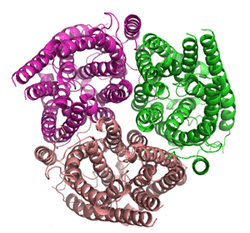 The structure of the RHCG protein indicates that it has a hydrophobic ammonia-conducting channel and shows that it shares a common fold with the ammonia transporters, thus making it an ammonia transporter. ↑ "Entrez Gene: RHCG Rh family, C glycoprotein". ↑ Liu Z, Chen Y, Mo R, Hui C, Cheng JF, Mohandas N, Huang CH (August 2000). "Characterization of human RhCG and mouse Rhcg as novel nonerythroid Rh glycoprotein homologues predominantly expressed in kidney and testis". J. Biol. Chem. 275 (33): 25641–51. doi:10.1074/jbc.M003353200. PMID 10852913. ↑ Biver S, Belge H, Bourgeois S, Van Vooren P, Nowik M, Scohy S, Houillier P, Szpirer J, Szpirer C, Wagner CA, Devuyst O, Marini AM (November 2008). "A role for Rhesus factor Rhcg in renal ammonium excretion and male fertility". Nature. 456 (7220): 339–43. doi:10.1038/nature07518. PMID 19020613. ↑ PDB: 3hd6​; Gruswitz F, Chaudhary S, Ho JD, Schlessinger A, Pezeshki B, Ho CM, Sali A, Westhoff CM, Stroud RM (May 2010). "Function of human Rh based on structure of RhCG at 2.1 A". Proc. Natl. Acad. Sci. U.S.A. 107 (21): 9638–43. doi:10.1073/pnas.1003587107. PMC 2906887 . PMID 20457942. Bakouh N, Benjelloun F, Cherif-Zahar B, Planelles G (2006). "The challenge of understanding ammonium homeostasis and the role of the Rh glycoproteins.". Transfusion clinique et biologique : journal de la Société française de transfusion sanguine. 13 (1-2): 139–46. doi:10.1016/j.tracli.2006.02.008. PMID 16564724. Zidi-Yahiaoui N, Ripoche P, Le Van Kim C, et al. (2006). "Ammonium transport properties of HEK293 cells expressing RhCG mutants: preliminary analysis of structure/function by site-directed mutagenesis.". Transfusion clinique et biologique : journal de la Société française de transfusion sanguine. 13 (1-2): 128–31. doi:10.1016/j.tracli.2006.02.025. PMID 16580862. Ridgwell K, Spurr NK, Laguda B, et al. (1992). "Isolation of cDNA clones for a 50 kDa glycoprotein of the human erythrocyte membrane associated with Rh (rhesus) blood-group antigen expression.". Biochem. J. 287 (1): 223–8. PMC 1133147 . PMID 1417776. Liu Z, Chen Y, Mo R, et al. (2000). "Characterization of human RhCG and mouse Rhcg as novel nonerythroid Rh glycoprotein homologues predominantly expressed in kidney and testis.". J. Biol. Chem. 275 (33): 25641–51. doi:10.1074/jbc.M003353200. PMID 10852913. Marini AM, Matassi G, Raynal V, et al. (2000). "The human Rhesus-associated RhAG protein and a kidney homologue promote ammonium transport in yeast.". Nat. Genet. 26 (3): 341–4. doi:10.1038/81656. PMID 11062476. Chen BS, Xu ZX, Xu X, et al. (2002). "RhCG is downregulated in oesophageal squamous cell carcinomas, but expressed in multiple squamous epithelia.". Eur. J. Cancer. 38 (14): 1927–36. doi:10.1016/S0959-8049(02)00190-9. PMID 12204676. Verlander JW, Miller RT, Frank AE, et al. (2003). "Localization of the ammonium transporter proteins RhBG and RhCG in mouse kidney.". Am. J. Physiol. Renal Physiol. 284 (2): F323–37. doi:10.1152/ajprenal.00050.2002. PMID 12388412. Nicolas V, Le Van Kim C, Gane P, et al. (2003). "Rh-RhAG/ankyrin-R, a new interaction site between the membrane bilayer and the red cell skeleton, is impaired by Rh(null)-associated mutation.". J. Biol. Chem. 278 (28): 25526–33. doi:10.1074/jbc.M302816200. PMID 12719424. Hemker MB, Cheroutre G, van Zwieten R, et al. (2003). "The Rh complex exports ammonium from human red blood cells.". Br. J. Haematol. 122 (2): 333–40. doi:10.1046/j.1365-2141.2003.04425.x. PMID 12846905. Bakouh N, Benjelloun F, Hulin P, et al. (2004). "NH3 is involved in the NH4+ transport induced by the functional expression of the human Rh C glycoprotein.". J. Biol. Chem. 279 (16): 15975–83. doi:10.1074/jbc.M308528200. PMID 14761968. Zidi-Yahiaoui N, Mouro-Chanteloup I, D'Ambrosio AM, et al. (2006). "Human Rhesus B and Rhesus C glycoproteins: properties of facilitated ammonium transport in recombinant kidney cells.". Biochem. J. 391 (Pt 1): 33–40. doi:10.1042/BJ20050657. PMC 1237136 . PMID 15929723. Huang CH, Peng J (2005). "Evolutionary conservation and diversification of Rh family genes and proteins.". Proc. Natl. Acad. Sci. U.S.A. 102 (43): 15512–7. doi:10.1073/pnas.0507886102. PMC 1266151 . PMID 16227429. Marini AM, Boeckstaens M, Benjelloun F, et al. (2006). "Structural involvement in substrate recognition of an essential aspartate residue conserved in Mep/Amt and Rh-type ammonium transporters.". Curr. Genet. 49 (6): 364–74. doi:10.1007/s00294-006-0062-5. PMID 16477434.